Stainless steel has a particular grain -- or direction -- similar to wood. Take a good close look at your stainless steel item to see which way its grain goes, and always clean and polish in that same direction. Ignore stainless steel grain at your peril – or risk actually forcing dirt, grease, etc. deeper into the steel’s grooves. “Shop” your kitchen cabinets for the best cleaners. Search no further than your kitchen cabinets for the best and gentlest stainless steel cleaners. Apply your choice of undiluted white vinegar, club soda, or a warm water/dish soap blend to the steel surface with a soft cloth, preferably cotton or microfiber. Go easy – your cleaning cloth should be just damp. Then gently wipe dry. Never use harsh chemicals or abrasive cleansers on stainless steel kitchen appliances or sinks; these may actually scratch and deteriorate the metal. Also avoid paper towels, which can leave lint marks, and don’t even think of using a cleaning brush or ... shudder! ... steel wool. Polish up stainless steel with olive oil. Here’s a pro cleaning (or should we say “gleaming”?) 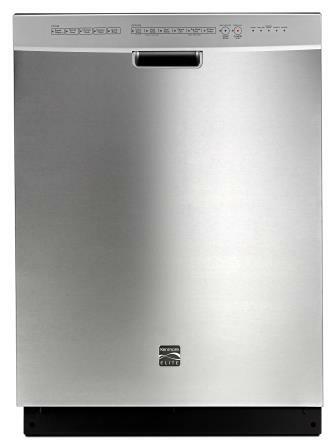 tip to restore the luster of stainless steel stoves, fridges, or dishwashers. Once you’ve cleaned and dried the steel, dab on a little bit of olive oil and rub it in, always going in the direction of the grain. 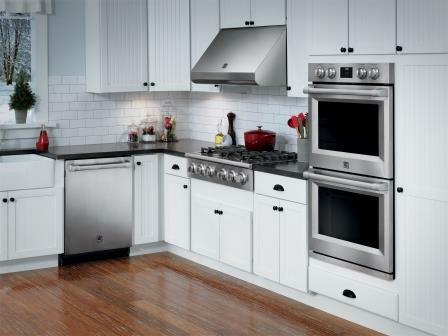 Even older stainless steel appliances will start to gleam as good as new. Don’t happen to have any OO on hand? Sub mineral oil instead. Buff a stainless sink with … flour?! For a sparkling stainless steel sink, proceed as in Steps 1 and 2. Once the sink is nice and clean, use flour for that final spit-and-polish effect. The point of the flour: stainless sinks tend to accumulate ground-in dirt over time. The flour will absorb this dirt, leaving your sink beautifully shiny. No matter how careful you are, life happens. The appearance of your stainless steel appliance or sink may be affected by wear and tear, polishing against the grain, or using rough cleaning pads (we warned you!). Treat scratch marks by polishing with a dedicated stainless creme like Cerama Bryte on a soft, clean cloth. Repeat two or three times, always parallel to the grain. Beware fridge magnets on a stainless steel refrigerator; their edges are a scratching hazard. Use a rubber mat to safeguard your sink against scratches while washing pots. Avoid stains -- remove the mat between uses and never leave pans or dishwater sitting in the sink. Wipe spills and spots off appliances ASAP, and gently rub, don't scrub, to protect the stainless shine.